In the unlikely event that you should ever want to part with your Steinway, you will not have difficulty in finding a buyer. No other instrument offers the fundamental durability that makes the repair of almost every used Steinway a worthwhile investment. What is more, no other instrument is as desirable on the second-hand market, where it is capable of commanding 25-30% of the current list price even after 30 years of use. Steinway pianos have passed down generations within a family, and yet commanded an unbelievable price when sold, simply because, a Steinway appreciates over time. It is an investment as much as it is an instrument of unimpeachable quality. When you purchase your Boston or Essex piano from us, you become eligible for a benefit known as the Steinway Promise. 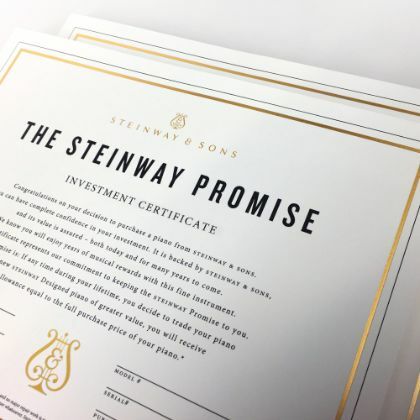 This promise grants you ten years to take advantage of receiving full trade-in value on your Boston or Essex piano (in saleable condition) towards a new Steinway grand piano. If you have ever hoped and dreamed of moving up to a Steinway grand, we are about to present you with the best opportunity you may ever have to exercise that option.